One big challenge in analyzing market regimes is identification, as they are not directly observable. As an unsupervised statistical learning problem, there is no verifiable “right answer”. Beyond identifying regimes, we also want to know the probability of being in a given regime at any given point in time. Finally, our economic activity is measured via time series. Fortunately, a standard ML technique exists which possesses these attributes: hidden Markov model (HMM). For readers unfamiliar with HMM, here is a brief summary on the theory relevant to our problem. 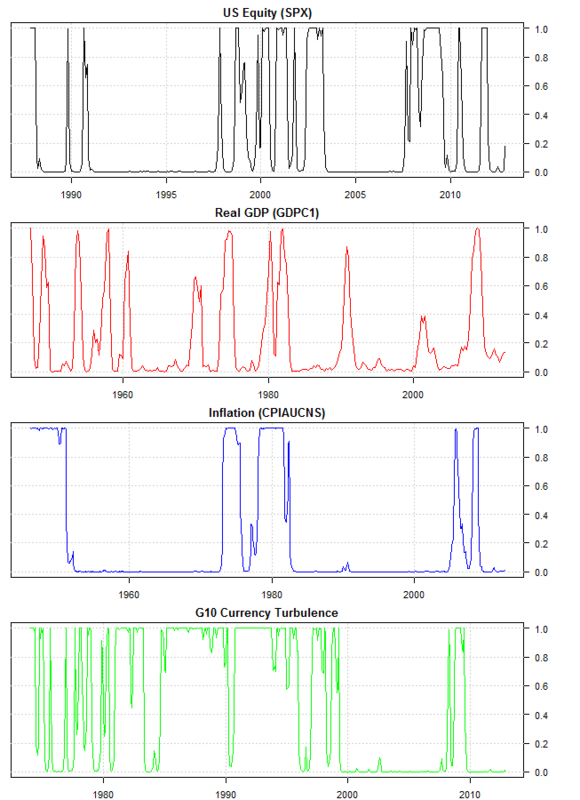 See Hidden Markov Models for Time Series by Zucchini and MacDonald (2009) for more details. In other words, the probability of being in regime at time given the observed data . Where and are forward and backward probabilities along the Markov chain at time (estimated via iterative maximum likelihood using expectation maximization), and is the likelihood at time . Readers with ML background will recognize HMM as an elementary temporal graphical model (see § 6.2 of Koller and Friedman (2009)). With this tiny bit of HMM theory, we can now formulate our regime analysis problem in economic terms and use a bit of R to solve it. Consider four measures of economic activity: US equities, real gross domestic product (GDP), inflation, and G10 currencies. Posit each measure of economic activity can be characterized at any point in time as being in either one of two states: stable with corresponding small downside volatility or contracting with corresponding high volatility. This broadly matches traditional wisdom, namely the macroeconomy is either acting “fairly normal” or is exceptional (either panic or exuberance). Worth noting is the obvious caveat that this bi-state model oversimplifies reality, in particular ignoring potential distinction between “growth” and “stagnancy” (of potential importance during 1970s and 2010s). Intuition is unclear a priori whether a bi- or tri-state model is preferable. A subsequent post will take up this model selection question, as it lacks an easy answer. These regimes match our economic recollection. Equities were normal through much of the 1990s and mid-2000, and in panic the remaining time. GDP growth was exceptionally strong in the mid-1990s, during recovery from dotcom bubble in early 2000s, and during recovery of mortgage bubble in late 2000s; growth during all other times was “normal”. Inflation was high during the late 1970s and flanking the mortgage bubble. Currencies were volatile throughout 1980s and 1990s and then again flanking the mortgage bubble. These regimes also illustrate just how unusual the mortgage bubble was in historical sense, as it is the only time in the past 30 years during which all four measures of macroeconomic activity were simultaneously in exceptional regime. Code to replicate the above results, and quite a bit more to be discussed in subsequent posts. Note: US equity regime is estimated using daily returns from SPX, rather than equally-weighted basket of S&P 500 sector indices as in the original article. Doing so results in nearly identical equity regime conditional probabilities, hence SPX is chosen in recognition of Occam. # statistics and plotting local decoding. # sector indices, use SPX instead. # Estimate two-state markov (CPI-based) inflation regime. # Estimate two-state markov (GDP-based) growth regime. # several times to get convergence on the regime reported by Kritzman. # Estimate two-state markov (G10-based) currency turbulence regime. # Estimate n-state hidden markov model (HMM) for val. # Plot markov regimes from HMM: kernel densities and per-regime local decodings. Nice post, which package does the dROC, getOhlcv etc functions reside in? Re functions: some are common utility functions, which are not currently packaged; others are private because they depend on access to a large private data warehouse, which cannot be replicated with standard quantfin libraries (e.g. quantmod, etc). If there is sufficient reader interest, I can make the utility functions available. I am looking at the code and I guess dROC is the same as TTR::ROC using type=”discrete”? Then, I guess getOhlcv is the same as quantmod:getSymbols just that it looks in your DWH? If this is true, then the only function missing definition and source code is rollingTurbulence since I can not find it anywhere else in R universe. I would appreciate if you can share the code. Any chance to share code asked for in the comment section of another great article from you https://quantivity.wordpress.com/2012/10/23/volume-clock-gaps-and-goog/ ? Thank you. @Eduardo: I added dROC to the post. I have a version of the data access functions functions which stub into quantmod equivalents (and vice versa, so these functions interoperate with OHLCV functions), which I can make available in a subsequent post depending on reader interest. Covering turbulence is on the agenda for subsequent post in this series, as this paper depends on it (not to mention Kritzman is an author on a preceding paper covering turbulence). Finally, I can share TAQ code in a post subsequent to this market regime series. Thanks for the hmmFit package pointer. Thank you for a great post. You mention you have a large private data warehouse. Which sources do you use? Any suggestions on how to store such quantity of data (H2, sql, csv, …). Any special R packages you recomend? Thanks, looking forward to your next post. Thanks for this post and the accompanying code. The rollingTurbulence function does not seem to be part of the code. Is it part of your private data/code warehouse? Please share it if possible. hope that’s a useful comment. @Alain: thanks for your comment, I will take a look at the paper. @Arthur: thanks for link to Rabiner; although dated, I concur it is one of the best introductory tutorials. Re risk on/off: I concur MA models are competitive with HMM for US equity indices, although average lengths are somewhat regime-sensitive (e.g. 50/200 has not worked consistently over the past 20 years). For other instruments and markets (especially spreads and synthetics), HMM models may be superior. I just stumbled across your blog today and am enjoying your impressive posts. I see you are active on Twitter but haven’t posted here for a while. I am interested if you have plans to post the rollingTurbulence implementation so that I can look at your regime results over more current time periods. @Jonathan: thanks for your kind words. Yes, I will do a follow-up post on turbulence, given the interest in seeing full implementation. any chance to see a follow-up for this beautiful article? Recently discovered Blog on Quantitative Trading. Ina single word: excellent! A question on the equity turbulence – did you use the S&P 500 constituents in calculation of the turbulence? Because the turbulence index requires cross-mean and covariance matrix. pupil or learner can find results gpa marks. Thank you!